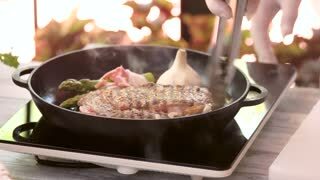 Cooking steak in grill pan. 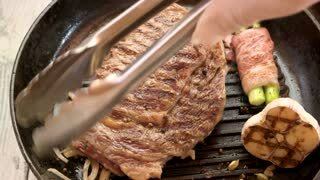 Tongs flipping piece of meat. 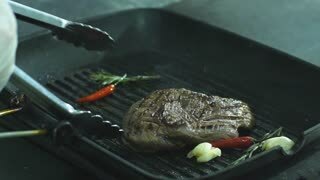 Tongs flipping steaks in pan. Grilled meat with spices. Cook a main course. Hand with tongs flipping steaks. 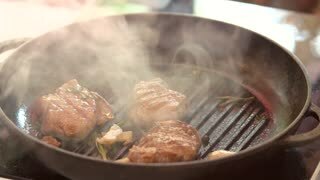 Chef cooking meat. Pan with a steak. Chef's hand with cooking tongs. Steak in a grill pan. Hand holding pair of tongs. 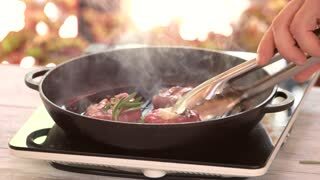 Tongs flip steaks in pan. Grilled meat with rosemary. 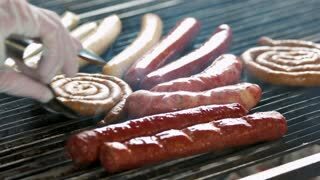 Grilling sausages closeup. Hand of chef using tongs. 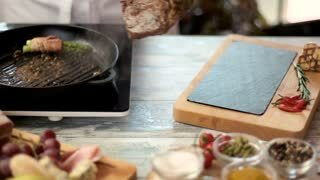 The chef in black rubber chef gloves serves a dish spreading on thin bread a slice of grilled tasty meat on the bone and chopped corn grilled in the oven.